PLAY IN OUR SWEET TREATS LAUNCH ROOM! Cupcake Bingo has arrived! To celebrate, we’re dishing out an unbelievable selection of Sweet Treat prizes in our launch room every night from 25 June – 8 July, where you could win anything from cookbooks and cupcake makers, to bonuses and loyalty points! The game plays out every day at 9pm and you can pre-buy your tickets for JUST 5P EACH! Keep an eye on our Facebook page to find out what the daily prize is…and good luck! 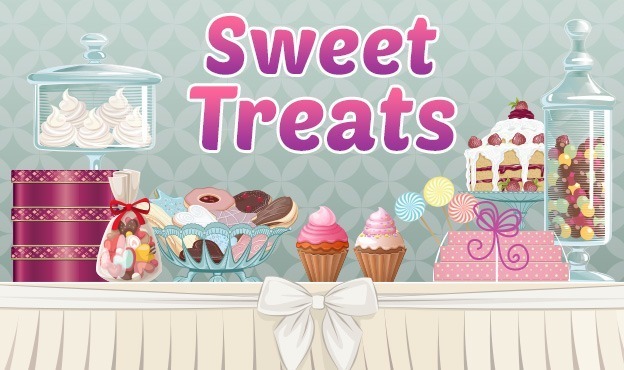 • The Sweet Treats game will take place on the 15th of every month. • The Sweet Treats room is exclusive to Cupcake Bingo players. • There will be a monthly pre-buy time before each game. • Each month’s prize will be announced on Facebook and on the Sweet Treats lobby tab. • Prizes will either be tangible, bonus funds or loyalty points. • If for any reason any of the tangible prizes are no longer available Cupcake Bingo has the right to change the prize or offer the cash equivalent. • The winner/s of each game will be contacted within 72 hours. • Bonus Funds or Loyalty Points will take up to 72 hours to credit. • If there is more than 1 winner of a tangible prize, winners will split the cash equivalent. • If there is more than 1 winner of Bonus Funds or Loyalty Points, the amount will be split. • Please allow 21 days for delivery. If your prize has not arrived within 21 days please contact our promotions team at promotions@cupcakebingo.com. • Cupcake Bingo reserves the right to change this promotion or stop this promotion at any time.